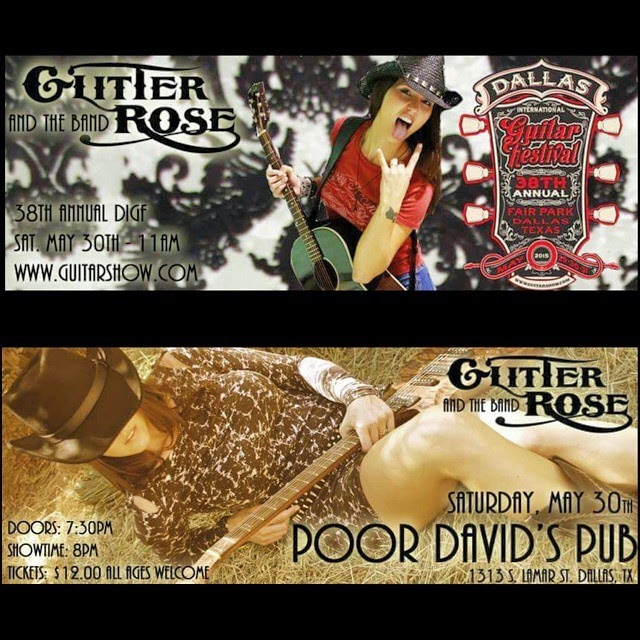 May 27th, 2015 - Dallas, TX -- Hometown girl and independent southern rock artist and music producer Glitter Rose has been rocking the Los Angeles music scene since 2012, and now returns to Dallas for 2 very special live music events. Saturday, May 30th both Dallas International Guitar Festival and Poor David's Pub will host performances by the lefty-lady guitar slinger and songstress for her hometown fans and beyond to enjoy. Glitter will be accompanied by her band including lead guitarist Rob K, drummer Chris Hoffman and bassist Erik Ralston, all of which are Los Angeles based pursuing their careers in music and its industry. Glitter Rose and The Band are currently recording an album titled "Outlaw In Love", produced by Glitter Rose and mixed and engineered by Francisco Rodriguez. Both Glitter and Francisco are Recording Academy members and will be submitting the album for GRAMMY consideration in 2016. This will be GR's 3rd full length album, and 1st sole producer attempt. Her album "Dead or Alive" released in 2012, was co produced by Dran Michael and Glitter Rose, and snagged several awards, including Album of the Year in the 2013 AIMAs, which led to a total of 8 awards in a span of 2 years. GR is also currently developing and producing young artists in Los Angeles. She has also written for 2 feature film soundtracks. The title track for indie film "American Girl", which she also makes a cameo appearance in and acts as associate producer, and a co-write with legendary musicians Stu Hamm and Kim Se Hwang for the Korean box office smash "The Technicians". Dallas International Guitar Festival will host Glitter Rose and The Band on the Category 5 Stage at 11am Sat. May 30th. 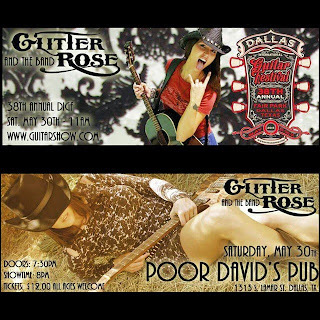 That evening, Poor David's Pub will open its doors at 7:30pm, with an 8pm performance by Glitter Rose and The Band. Both events are all ages. Tickets for DIGF can be found at www.guitarshow.com, while tickets for Poor David's Pub can be bought at the door for $12 each. For more information about Glitter Rose, please visit her website www.ThisIsGR.com.